It’s one of the most famous concepts in fiction: the idea of the dual personality. Robert Louis Stevenson cannot take the credit for inventing it – Edgar Allan Poe and Dostoyevsky had both written tales about ‘the double’ in the 1840s, some forty years before Stevenson put pen to paper – but he can certainly be applauded for giving us the definitive literary ‘type’. Whenever we talk about someone leading a dual life, we reach for ‘Jekyll and Hyde’ as an illustrative literary shorthand. The short novella, Strange Case of Dr Jekyll and Mr Hyde, appeared in early January 1886, just too late for the (potentially lucrative) Christmas market. Note the absence of the word ‘The’: Stevenson insisted the novella’s title encapsulate the strangeness and the newspaper-like brevity of the case, by eliding the definite article. It was an instant bestseller and over forty thousand copies are thought to have been sold in the first six months. It would go on to have a huge influence on later writers, such as Stevenson’s near-contemporary, the Welsh writer Arthur Machen. The idea came to Stevenson in a dream, and he wrote it up quickly into a story. Stevenson’s nephew recorded: ‘I don’t believe that there was ever such a literary feat before as the writing of Dr Jekyll. I remember the first reading as if it were yesterday. Louis came downstairs in a fever; read nearly half the book aloud; and then, while we were still gasping, he was away again, and busy writing. I doubt if the first draft took so long as three days.’ However, Stevenson’s wife was critical of this first draft, so he threw the manuscript in the fire, intent on starting again from scratch … at least so the story goes. Nobody is sure whether he actually incinerated the first draft or not, but it’s certainly become part of the legend surrounding the story. Stevenson (his middle name was pronounced ‘Lewis’, much like St Louis in Missouri) had learnt the art of writing the hard way, playing what he called ‘the sedulous ape’ to earlier critics and essayists in the attempt to forge a living from his pen. Fellow author G. K. Chesterton thought he learnt his craft well: Stevenson ‘seemed to pick the right word up on the point of his pen’ every time. 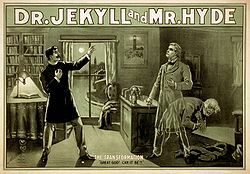 What Jekyll and Hyde is really about has kept many literary critics busy for the last century: it certainly appears to be an allegory, but whether it is about the dangers of drink (the ‘transforming draught’ is really alcohol, and Jekyll, when intoxicated, becomes a dangerous and violent alcoholic), or drugs (laudanum? ), or the need for civilised man to tame the animal beast within (Hyde is ‘apelike’, a characteristic no doubt informed by Darwinian natural selection that had recently revealed our kinship with other primates), nobody really knows. Perhaps that is what gives the book its power: at bottom, it is a mystery that remains mysterious even after the last word has been read. Jekyll isn’t schizophrenic: his condition might be likened to dissociative identity disorder, but not to schizophrenia per se. This is because when we talk about someone being ‘schizophrenic’ in the sense of having a split personality, we are not using the word according to its strict, clinical meaning: the psychological disorder (known as dementia praecox until the word ‘schizophrenia’ was coined by Eugen Bleuler in 1911) describes a split between the individual and reality, not between two different personalities. This figurative sense of schizophrenia to mean ‘split personality’ was originated, fittingly enough, by a writer: the poet and critic T. S. Eliot, in an essay of 1933, is credited with introducing this alternative meaning into the language. Really enjoying reading your blog. Fascinating stuff. Keeping the Frankenstein post in my bookmarks until I start working on that at A2 level! So good to see posts on the classics. I didn’t read any this year and I usually manage to get a few in. Thanks for all of your kind comments – more literary bloggage will follow! Wonderful post-very epigrammatic. I will say I have to agree with the theory in regard to the ‘transforming draught’. In my opinion it seems very appropriate, although anyone I’ve ever spoke with seems to stand beside the ‘split-personality’. It’s good to know the truth is out there & someone agrees with me (or I with you, however you choose it to be).